I know God’s love. I know the freedom and acceptance that comes with God’s love. I like to think I know his heart…not just for me, but for others, especially when I make life choices based on where I am called to love others for him. But sometimes we need to know his anger, his utter disbelief and how much his heart truly breaks at the sin surrounding his beloved children. Recently I was in church being used as a jungle gym. Schnider would not sit still. We had already gotten a drink of ‘dlo’ before I sat down in church, and his frustration at my not taking him again, when he knew I could understand what he was asking for in Creole, was very real. But he didn’t want to go alone. Instead, he sat. He pouted. He shifted. He stood on me. He stood at my side. He laid his head on the bench in front of us. He put his head on my shoulder. He moved my water bottle. He flipped through the pages in my Bible. He sat again. Then he stood on me. In the midst of all this shifting, I found myself getting annoyed that he couldn’t get comfortable. Relax already, friend. I am here for you. But also in that exact thought was this awareness that someone had left him. For whatever reason…reasonable or wholly unreasonable…Schnider had been abandoned through whatever situation had landed him at the village. And that awareness flooded me with pain that this was not right. This wasn’t how it was meant to be. As much as my heart broke in that moment for this little guy, as much as it breaks for all of the orphans God has placed in my path over the last ten years in a myriad of places, I find that God’s heart breaks a million times a million more times for those who are abandoned. For all children, adults, anyone…God’s heart breaks for the ways they have been abandoned and made to feel they are unwanted, unworthy and unloved. It is absolutely beyond my comprehension how anyone could choose to leave a child, and this is coming from someone who does not even have children. I am profoundly sad for who the world calls orphans. Parents die, or cannot provide for them. Grandparents, aunts, uncles…no relatives to choose to take care of them. I think God shares in my disbelief. I think God feels that utter disbelief when the connection created through birth is ripped to shreds when a parent, through death or stripped of dignity for whatever reason, leaves their child as an orphan. God did not create us for this. He created us as whole beings, meant for his Kingdom and to live as Kingdom walkers. He created us for love, and the sin of this world breaks love. 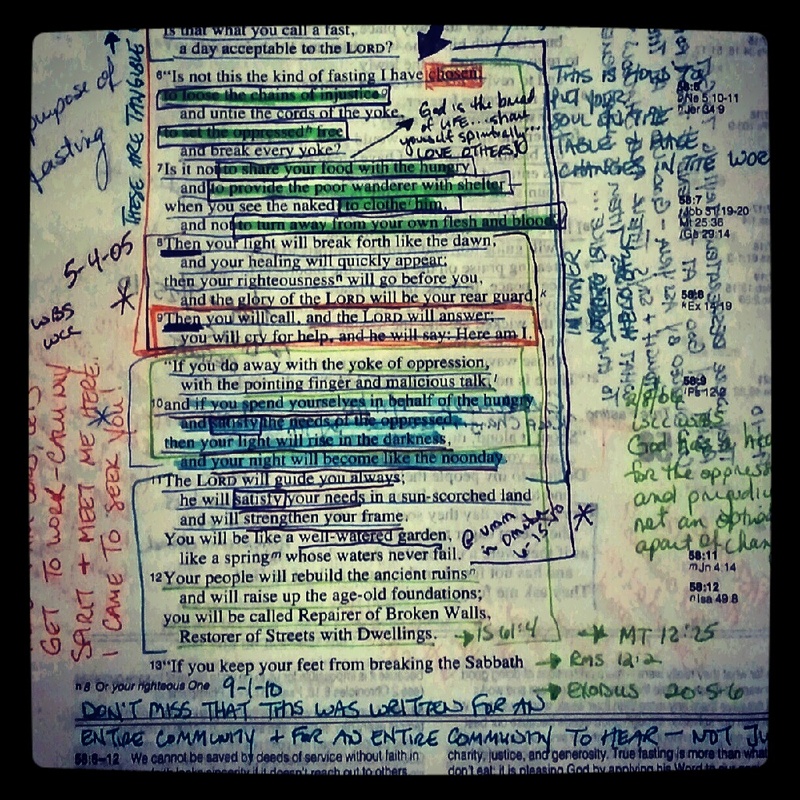 In Isaiah 58, God is calling out his people for fasting and not meaning it. I have been seized by this passage for four years this month. Obsessed is probably not even a strong enough word for what hold this passage has on me. It starts calling everyone out on how they say they know God, but only for set apart times and not with their lives. Then moves into what God does want them to be doing…that they are not actually doing. I remember asking a friend what he thought the beginning meant, ‘Shout it aloud, do not hold back. Raise your voice like a trumpet.’ His response has stuck with me, ‘Be loud. Talk about what God has been opening your eyes to in these verses.’ With those words, he ignited something in me. I realized I had a voice and I wasn’t using it the way God wanted me to be using it. Granted, with that advice, over the last four years my voice has been met with resistance, anger and disrespect, yet also love, camaraderie, understanding, awakening and more than anything else a trueness that many of us are speaking the same Kingdom language. But we need to be speaking that language louder. We need to be calling out the things in this world that fight against the heart of God. Our silence is our acceptance. I adamantly refuse to accept that God wants children to be abandoned by their parents or left alone in this world after their parents are gone, but that is my voice and my calling, and consequently where I find myself living. Refusing to be silent is part of what landed me in Haiti, allowing God to use me to love his kids and journey with others being ignited to the same. What are the things you show you accept through your silence? God has given us a voice for the abandoned, lost, lonely, broken and outcast. Where your voice takes you is between you and the Savior you serve. It will make you cross paths with people you never thought you could meet. It will make you uncomfortable. It will challenge your status quo. It will transform you. It will also draw criticism from others who profess to believe what you believe. But the bottom line is God is calling on you to use your voice. I am called to use my voice for the orphan, and I will be shouting that from the rooftops while annoying all within my shouting distance. I refuse to let the world tell orphans they are worthless, no one wants them and they deserve to be an orphan. God’s heart is for the orphan. God’s heart is for them to be made whole by being a part of his Kingdom family. I choose to be used as a jungle gym, then a soft place to land and sleep. I choose to love with abandon. I choose to love with whatever amount of God’s love I have flowing through me. I choose to go deeper, and I choose to know God’s heart…even when it breaks me.